Agriculture Watchdog Investigating Secretary’s Plan to Move Offices Out of D.C.
Agriculture Adviser Defends Planned Research Office Moves From D.C. In another twist in the saga of Agriculture Secretary Sonny Perdue’s controversial plan to relocate two key research agencies outside of Washington, D.C., the inspector general for the Agriculture Department is opening a probe of the legal basis for the decision to move what would likely be 700 employees. The IG decision was announced on Thursday by Rep. Steny Hoyer, D-Md., the minority whip, and another Washington-area lawmaker, Del. Eleanor Holmes Norton, D-D.C. The IG’s review of the plan to relocate, by the end of 2019, the Economic Research Service and the National Institute of Food and Agriculture will “determine USDA’s legal and budgetary authority to execute” the moves, which also include a plan to restore the research service to its previous status as part of the Office of the Chief Economist, in the secretary’s office. Investigators will also “determine USDA’s adherence to any established procedures relating to agency realignment and relocation, and procedures associated with cost benefit analyses (including factors such as staff recruitment and retention, access to agency services, and cost efficiencies),” the announcement said. The IG did not respond to Government Executive requests for confirmation. 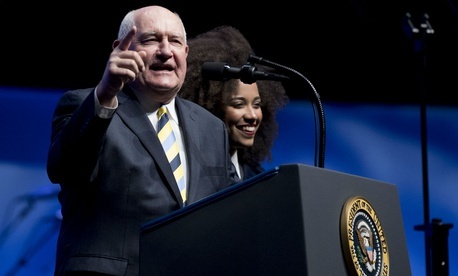 Separately on Thursday, Perdue became the subject of complaints by a nonprofit ethics group for an alleged violation of the Hatch Act limiting partisan political activity in the federal workplace. The secretary last week had traveled to Illinois and appeared at a town meeting for Republican Rep. Mike Bost, at which “he appeared to endorse” the incumbent, said a complaint filed with the Office of Special Counsel. “It’s good to have [Bost] in [the House of Representatives] fighting for your interests,” Perdue was quoted as saying during a discussion of agriculture and trade policy. The Project on Government Oversight argued that this was a “likely violation” of the Hatch Act, which prohibits federal employees from making partisan endorsements at official events.